The Easter Island Statue Project (EISP) was founded by Jo Anne Van Tilburg in 1982. Since 2000 she has served as EISP co-director with her Rapa Nui colleague, Cristián Arévalo Pakarati. Their collaboration represents the longest, continuous international scientific collaboration inRapa Nui history. The founding goal of EISP was the field and museum inventory of all Easter Island monolithic sculpture. The resultant survey, mapping, and excavation activities, along with the associated database and archive, are the basic analytic tools now supporting our research into the structural analysis of chiefdoms, the integration of symbolism and identity, and the interactive cultural roles of art, history, and ecology in Rapa Nui Society. These same resources, however, allow us to save the statues. The Easter Island Statue Preservation Foundation is a not-for-profit corporation established by Johannes Van Tilburg and Jo Anne Van Tilburg. Its principle mission is to support the research, education, and conservation initiatives created by and through the Easter Island Statue Project (EISP). Implicit in this mission is the recognition that our specific research—along with the body of data we have generated and the scientific insights we have achieved—are the main tools required to promote Rapa Nui site preservation and encourage economic sustainability. collaboration with other U.S.-based not-for-profit entities. site preservation through the study of impact control, resource availability, sustainable archaeology, and education. Our main support mechanism is the Mana Gallery. Exhibitions support Rapa Nui artists and artisans. Our teaching and lecture programs communicate our findings to the Rapa Nui community, and a portion of our sales income supports EISP field and research programs. 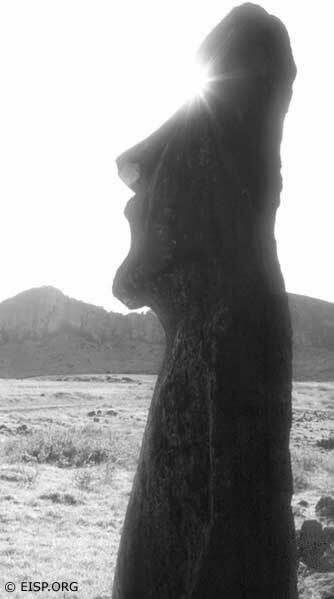 Empty eyesockets of a bearded moai standing near Ahu Tongariki are filled with sunbeams. Photo by David C. Ochnser, 1989. The monolithic statues of Rapa Nui (Easter Island) are called moai in the Rapanui language. Carved on the island by the ancestors of the current population, approximately 50% of the total of 887 statues documented to date still remain in the immediate vicinity of Rano Raraku, the quarry in which they were produced. The majority of the remaining statues were transported to and erected upon a variety of ceremonial structures called ahu. This feat is one of the greatest megalithic achievements of Pacific prehistory.